A local directory of 1874 lists three Deptford manufacturers of kamptulicon floor cloth: a rather distinctive-sounding product which I hadn't come across before. Indeed, the product was an interesting one which was fated to enjoy only relatively brief popularity. Experiments were conducted at Woolwich with some plates rivetted together like the sides of an iron ship, these plates being lined inside with cork and india-rubber, (the first idea of a cofferdam). It was expected that this preparation, which was known as "kamptulicon", would close up after shot had passed through and prevent ingress of water. 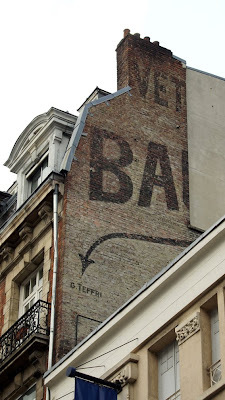 This was found to be quite correct, but the egress of shot on the other side had quite the opposite result. by Walter & Gough, is peculiarly distinguished. The price, however, is very high. In 1863 an alternative material, linoleum, was patented by Frederick Walton. Linoleum was cheaper, since it used oxydised linseed oil rather than rubber. Faced with this competition, kamptulicon went out of fashion and before too long, out of production. 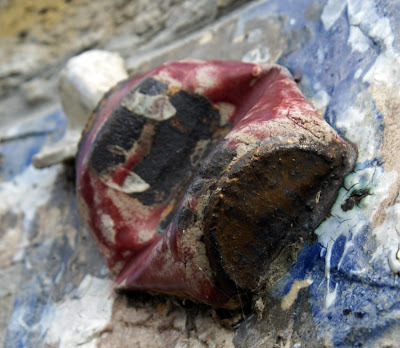 However, during its period of popularity, Deptford seems to have supported a surprising amount of its manufacture. 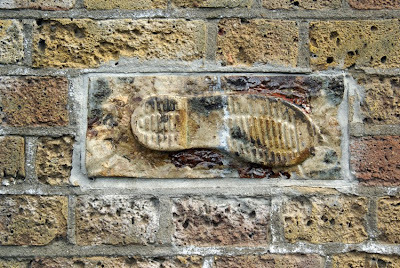 Yesterday about six o’clock in the evening, a Gentleman on horse-back, was stopt and robb’d by a single foot-pad, in a lane that leads from Deptford lower-road, to New-Cross. 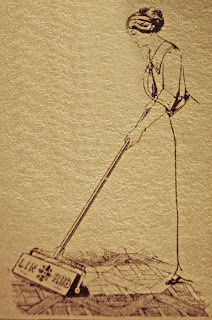 The Gentleman soon after met some Bricklayers, and other workmen, going home from their labour, and acquainted them with what had happened; upon which they immediately went in pursuit of the robber, and in searching the ditches, they soon found him lying all along in a dry ditch. The fellow perceiving himself discovered, got up and run for it, but was soon over-taken and surrounded in a large field; he then pull’d out a pair of pistols, and swore he would blow out the brains of the first man that should offer to take him; upon which the pursuers threw stones, dirt, and any thing they could get, to make him surrender; when the fellow found he could not withstand them, he made another push, and ran by them all; but unluckily for him, in endeavouring to leap over a muddy ditch, he fell short and stuck in the middle, where he was taken, but not till he had fired a pistol at the person who first seized him, but which happily did no damage; the rest of the pursuers came up and secured him, in order to his being carried before a magistrate. 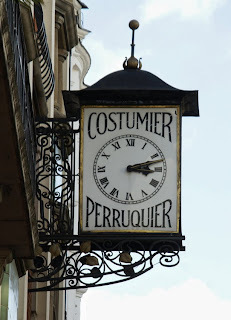 Look above street level in Wardour Street, and this fine clock might catch your eye. It's a little piece of theatrical history. 41-43 Wardour Street was built in 1905 for Willy Clarkson, a notable theatrical wigmaker (perruquier) and costumier. 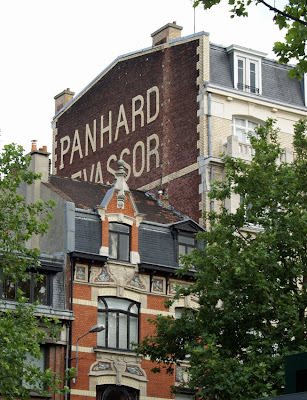 The business was clearly at its height when this Edwardian building was constructed. Looking back down to eye-level, we discover from two plaques that none other than Sarah Bernhardt laid the foundation stone in 1904; the following year, it was the turn of Sir Henry Irving to place the coping stone. According to the Times review of his biography, Clarkson was a very short, thickset man, 'almost grotesque to look at', but 'a genius at his art ... and as clever as any actor at using his personality for purposes of advertisement.' He made disguises for fancy dress balls as well as the theatre; rumour had it that his customers included Jack the Ripper. 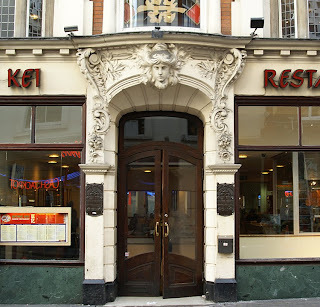 Many of the customers visiting what is now Wong Kei's Chinese restaurant, best known for the rudeness of its waiters, probably don't notice the building with its baroque flourishes and hints of art nouveau. That's a pity, since the entrance is an eloquent visual reminder of some of London theatre's finest moments. 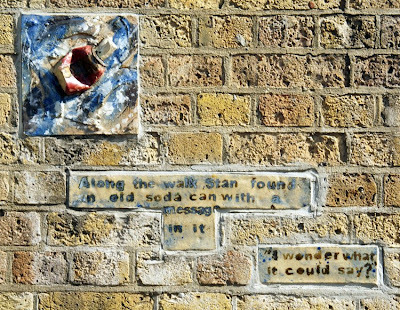 Bill Ellson, who has offered many helpful comments on this blog, now has his own - Deptford Misc. The first two posts look at the history of the Dog and Bell pub and the Iyengar Yoga Institute - no doubt there's lots more local history to come! 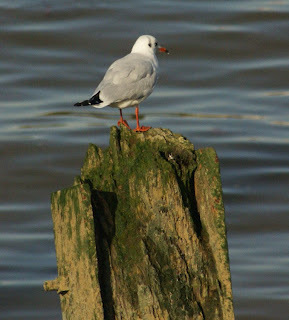 Update: thanks to ChrisP for identifying this as a distance post. 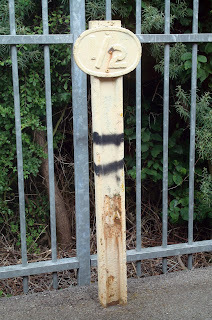 The '1/2' and the two black lines indicate a point half a mile from a major station or junction. Unfortunately, I still don't remember which station (between London and Portsmouth): any ideas? I took this picture from a train window while sat at a station somewhere between London and Portsmouth a few weeks ago. This week, there's an opportunity to see people commemorated on the Watts Memorial given life by the Actors' Temple. 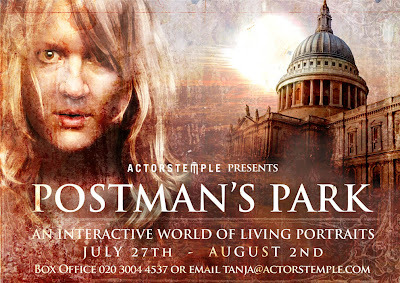 Their production Postman's Park, in St Pancras Church Crypt, creates a 'fully immersive world of interaction ... The audience is rewarded by asking questions, overhearing conversations and finding dark corners where secrets are shared.' You meet ten people from the plaques, as well as Watts himself, in the atmospheric surroundings of the crypt. Tickets are free; for times and booking details, click here. I'm not sure whether to thank Transpontine for introducing me to the British Pathe archive! It's full of fascinating material, so much so that I could easily waste far too much time browsing. 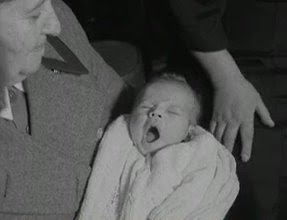 Among the gems is this film of Deptford midwife Miss Elsie Walkerdine at her retirement in 1957. She delivered over 4,000 local babies, and is shown visiting one of the last, Colin Paul Leary. Still on the childhood theme, earlier films show poor children of Deptford, and rather more confident youngsters enjoying themselves at the Rachel McMillan Nursery School in 1939. There's a poignant moment when the voiceover refers to the nursery 'founded during the War': while the film was shot in peacetime, a month later Britain would again be at war. In the eighteenth century, the most valuable perquisite (perk) of the naval shipwright's job was the right to remove chips. The term referred to offcuts of timber up to six feet in length, which the shipwrights would carry home on their shoulders. There was allegedly abuse of this right, with shipwrights sawing down planks to just below the maximum length - in work time - before carrying them away. Quality may also have been affected, with allegations that workers took the seasoned wood, leaving green wood for the actual shipbuilding. The right also cost the Royal Dockyards a great deal, estimated by William Sutherland in 1726 at £93,000 per year. It is unsurprising, then, that the shipyards tried to control the taking of chips while the workers did their best to minimise restrictions on it. On Friday afternoon a meeting of a very alarming nature took place at Deptford amongst the Shipwrights; we are given to understand it arose about their perquisites of chips. About four o’clock they were got to such a pitch of desperation, that the whole town was in the utmost consternation imaginable, and it seemed as if the whole place was struck with one general panic. But happy for the security of his Majesty’s subjects, an officer dispatched a messenger for a party of the guards, which fortunately arrived at Deptford at six o’clock, which secured the peace for the moment, but were soon found insufficient, and a second express was instantly disptatched for an additional supply, these were found not capable of keeping the peace; at eleven o’clock all the troops from the Savoy that could be spared arrived, which, happy for the town of Deptford, secured the place and restored peace. However, whatever the unrest it might provoke, the perk had to be brought under control. This was finally achieved at the beginning of the nineteenth century, when in July 1801 the perquisite was replaced by 'chip money' of 6d a day for shipwrights and half that for labourers. Further reading: there is a chapter on 'Ships and Chips' in Peter Linebaugh's The London Hanged: crime and civil society in the eighteenth century. 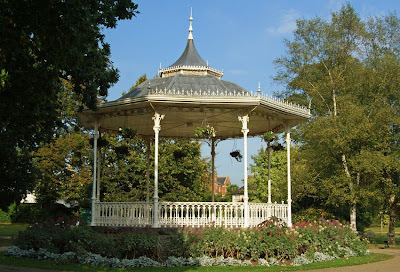 Both Taunton and Bridgwater have Victorian bandstands - structures which bring to mind nostalgia, summer sunshine, rented deckchairs and cheerful music. Of course, they were pretty practical in reality. Since the British summer is somewhat unreliable, the stand provided cover for the band as well as a bit of help with acoustics. Many were made in Scotland, including the one in Taunton's Vivary Park, the work of Walter MacFarlane & Co and its Saracen Foundry, Glasgow. It was installed in 1895, and even has a pattern number. Another thing the Victorians could order from catalogues! Walter MacFarlane & Co were apparently 'the most prolific architectural ironfounders the world has seen', shipping their products much further afield than Somerset. They were particularly popular in Brazil. MacFarlane himself began working as a jeweller, but after a few years was apprenticed to a blacksmith. In his early thirties, he set up his own company with his brother-in-law and a friend. It quickly became an institution in 1860s Glasgow, and continued to produce ironwork until the 1960s; the name has been revived recently by another company, Heritage Engineering. 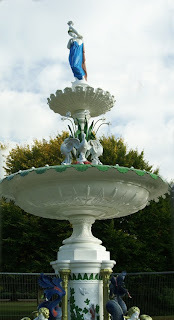 MacFarlane's also produced Vivary Park's fountain, which wasn't installed until 1907. This design was so popular that it could be found at Hartlepool, Aberdeen and Singapore! 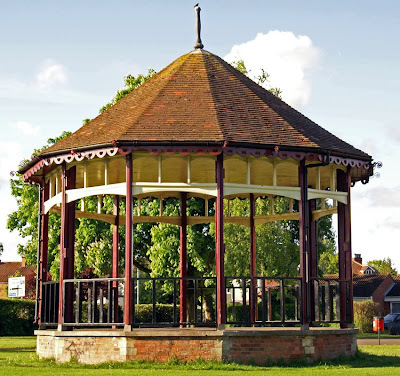 Bridgwater lagged behind its larger neighbour, only installing the current (brick, wood and tile) bandstand in Blake Gardens in 1908. Sadly, the summerhouse and archway which used to share the gardens have disappeared. Taunton's rather pompously-titled English and Foreign Corn Warehouse is shabby and faded today; its ground floor has been converted into two shops. However, the grandiose name suggests a rather more prosperous past! More faded glory is evident through the train window on the way out of town. 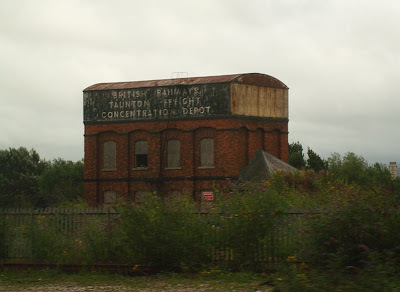 Here is another grand name consigned to history: the British Railway Taunton Freight Concentration Depot is now abandoned and neglected. British Rail itself, of course, has become a thing of the past. One of my favourite art events was this weekend: Art in Action, a huge show where as well as exhibitions and a marketplace, there are lots of opportunities to literally see art in action. A number of artists demonstrate various techniques from sculpture to illustration, while visitors can also try new skills or improve existing ones in a range of taster classes. My first efforts at marquetry won't get me an appearance any time soon, but here are some real artists at work. Images (top to bottom): Mexican tent, my marquetry, John Stroomer, Nikki Taylor, sculpture class, stone carving, Ruthanne Tudball. 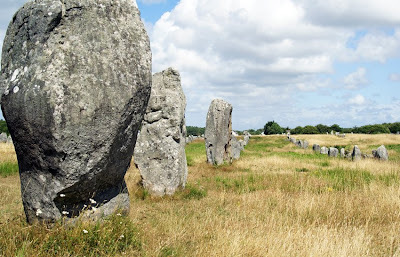 Earlier this week, I visited one of the most special sites in Brittany: the neolithic alignments at Carnac. These rows of standing stones - as many as eleven lines in places - stretch for kilometres. Forgotten for many years (or borrowed as building material), they were 'rediscovered' from the end of the eighteenth century and are now recognised as a protected site of exceptional importance. Nonetheless, their conservation remains controversial - from the use of bulldozers in the 1980s to moving stones for roads and fences, and the restricted access today which led to an occupation by protestors in 2002. As with so many prehistoric monuments, the meaning and construction of the alignments are shrouded in mystery. They are probably over 5,000 years old although they are likely to have been constructed over centuries - Aubrey Burl suggests that stones were perhaps added to regularly until Roman times or later. Given the amount of effort and labour involved in transporting, aligning and erecting 3,000 stones, some kind of religious purpose is often posited. Other theories include some kind of astronomical significance, memorials to the dead, or Pierre Mereaux's argument that they may have been primitive seismic instruments. Alternatively, local myth has it that they are ranks of Roman legionnaires turned to stone to protect Pope Cornelius as he fled persecution. The alignments were first excavated by a Scottish antiquary, James Miln, who found most of the stones no longer standing. His local assistant on those late-Victorian excavations, a boy called Zacharie Le Rouzic, became fascinated by the stones. A self-taught expert, he became director of the town museum holding Miln's finding and did a great deal of work on the stones themselves, including re-erecting those which had fallen. 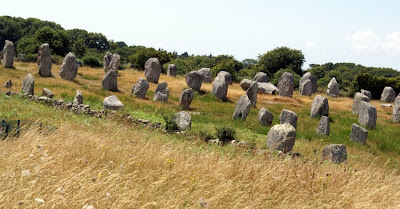 As well as the alignments, there are solitary menhirs, dolmens and tumuli. 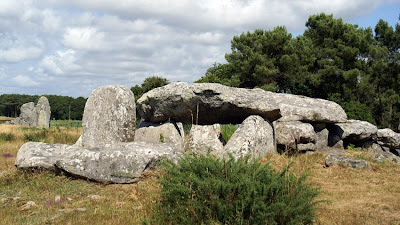 In fact, the local area is exceptionally rich in megaliths - well worth exploring, if you can resist the miles of sandy beach just the other side of town. Begin in the town centre for free maps from the Tourist Information and a shuttle bus to the stones. There is also a large car park by the Maison des Megalithes alongside the stones. The Maison des Megalithes has a book shop, information, film introduction and small exhibition. 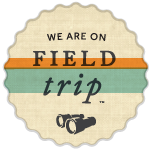 It is also the starting-point for guided tours. A 'petit train' does a 50-minute tour in French and English, which takes you the full length of the alignments as well as to the town's beaches. There are two ways to get inside the fences and right up to the stones. First, there are regular guided tours leaving from the Maison des Megalithes (about three a week in English). Second, there is open access during the low season (winter). 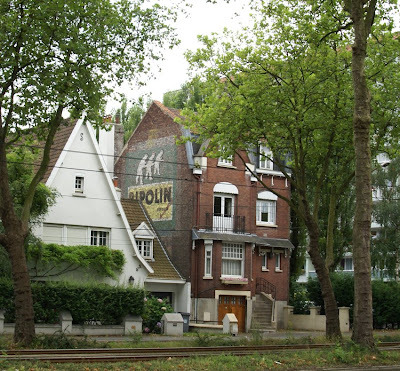 One of England's best Edwardian bowlers was born at 78 Evelyn Street, Deptford on 30 May 1879. He was the eldest of thirteen children, and on leaving school followed in his father's footsteps by becoming an apprentice fitter at Woolwich Arsenal. However, his summers were soon occupied very differently: Colin 'Charlie' Blythe would be one of the finest county cricket players of his era before dying in the First World War. His international cricket career was held back by his epilepsy and nervous temperament. He was not, then, obvious military material. Nonetheless, when the First World War broke out, Blythe enlisted first in the Kent Fortress Volunteers before serving in the King's Own (Yorkshire Light Infantry). On 8 November 1917, he was killed by random shell-fire on the railway near Passchendaele. He was one of over 200 county cricketers to enlist; 34 of them were killed in action. Last month, the England cricket team paid tribute to them and placed a stone cricket ball on Blyth's grave. Image: Vanity Fair print of Colin Blythe. Lee Jackson, author of Victorian London-set novels and the awesome Dictionary of Victorian London, has produced a new map of the nineteenth-century city. 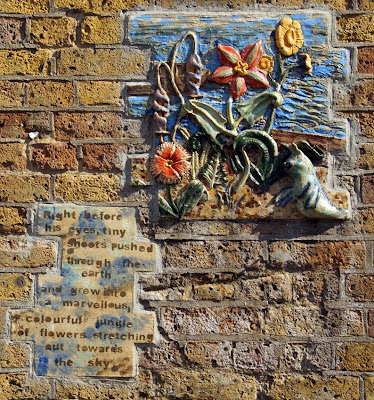 Local points of interest include Nunhead Cemetery, Greenwich Foot Tunnel and Greenwich Fair; but there's lots more to discover, so go and take a look! Update: the map is no more (click the original link for a full explanation) - but I'd still highly recommend the Dictionary of Victorian London, which has plenty of other maps, and Lee's blog, The Cat's Meat Shop. 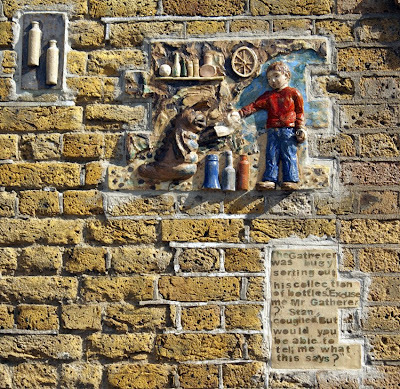 Deptford Mechanics' Institution was established in the early nineteenth century for 'the diffusion of knowledge', particularly on technical and scientific advances. While previous posts have looked at the establishment of the Institution, and one of the lectures held there, a notice from 1838 gives a good idea of the other ways in which the establishment could serve its members. One key point is the emphasis upon evening opening: the target membership were young men who worked during the day. The subscription would exclude the poorer workers - although it's difficult to translate values from one period to another, it was equivalent to £20 per quarter in purely inflationary terms, but somewhat more in relation to average wages. The Librarian will be in attendance every evening in the week except Sunday & Saturday, from ½ -past six till ½ -past nine, to issue books, &c. to the members; the daily, local, and other papers, and a variety of literary and scientific periodicals will be laid upon the tables of the READING ROOM. A SERIES OF INTERESTING LECTURERS ON SCIENCE AND LITERATURE WILL SHORTLY BE ANNOUNCED. SUBSCRIPTION Four Shillings per quarter. Cards of admission may be obtained of the Librarian any evening on which the Institution is open. Mr. JAMES RUSSEL, Academy, Prospect Place Deptford. 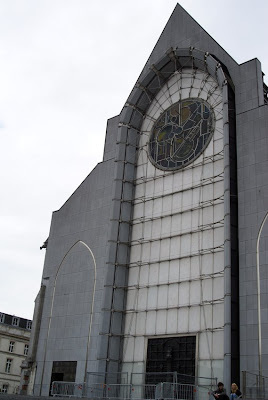 Lille Cathedral was an ambitious project, begun in the nineteenth century. It was intended to house a statue of the city's patron, Notre Dame de La Treille (Our Lady of the Arbour), in the most beautiful, sumptuous Gothic cathedral of the time. A site in the heart of the old city was chosen: the former castle mound. However, like many major building projects, the cathedral took a lot longer to build than expected. The first stone was laid in 1854; the last in 1999. Plans were scaled down as work progressed, and in 1947 a temporary brick facade was put in place; there would be a half-century wait for the permanent replacement. Indeed, looking at the front today one might think that the scaffolding has not yet been taken down. Unattractive as it might appear in sunlight, the wall is rather dramatic when lit from behind. 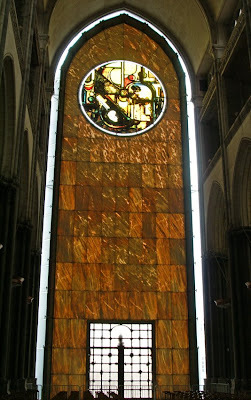 Thus, inside the cathedral during daylight (or outside after dark), the facade is transformed into a translucent marble wall, glowing with rich colour. 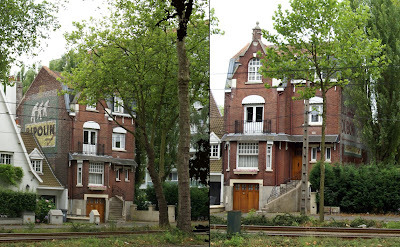 It is the work of engineer Peter Rice and local architect Pierre-Louis Carlier. 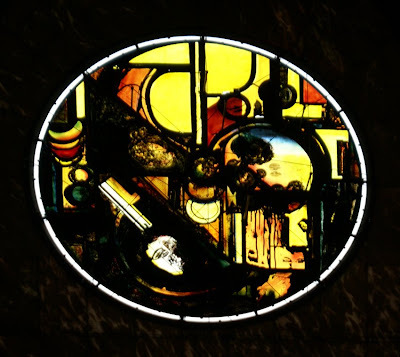 Inset is a rose window by Ladislas Kinjo, a Polish-French artist, on the theme of the Resurrection. Further viewing: there is a slideshow of the cathedral here (with French commentary). Today is France's national day, marking both the taking of the Bastille in 1789 and the Fête de la Fédération the following year, when King Louis XVI took a vow on the constitution in front of a crowd of 100,000 - the beginning of a short-lived constitutional monarchy. 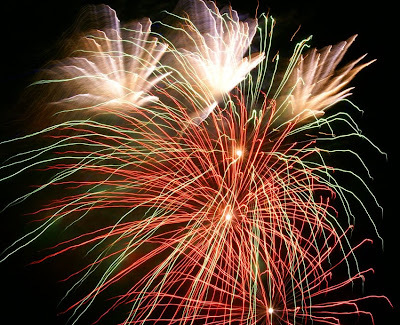 It is celebrated by meals, dancing and fireworks throughout the country. 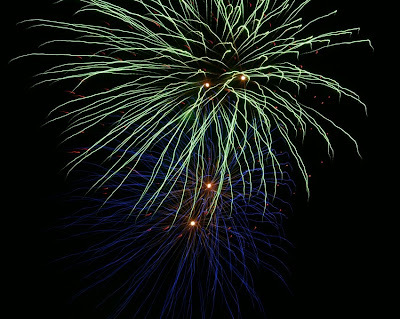 Langourla, like many villages and towns, actually had its party on Saturday; others will be this weekend. 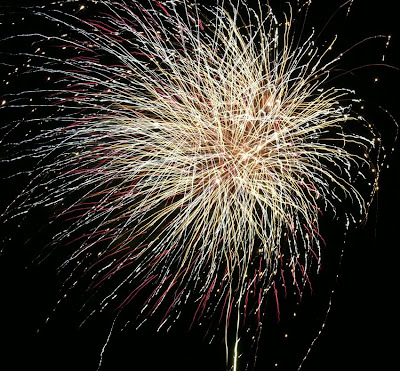 For once, I actually remembered to take my camera and try some firework photos, so here is this blog's very own 14 July firework display! 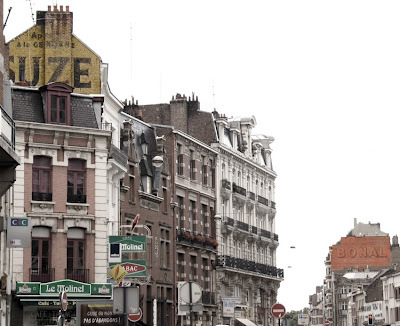 There are several signs for Ripolin on the roads leading into Lille. This brand of paint has a rather jolly logo: three painters (nicknamed Riri, Polo and Lino), complete with white overalls and brushes. It was invented by the Dutch chemist Carl Riep in 1888, and was a high-quality lacquer paint apparently used by Picasso. He, along with painters and decorators, appreciated its faster drying time. 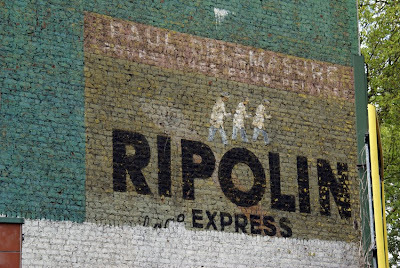 Indeed, the brand name became a verb, 'ripoliner'. 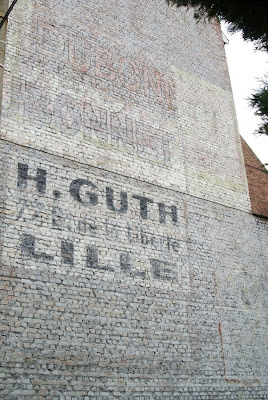 Today the brand produces a wide range of paints. The Gatherer then led Stan to a well where he drew up in a bucket the stickiest, blackest, smelliest gloop Stan had ever seen. Stan sat on the river bank with his dog and waited for the sunset to come. 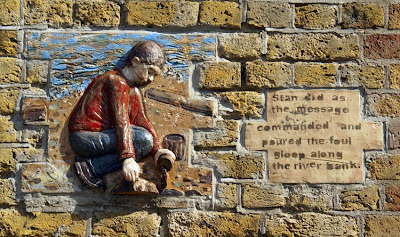 Stan did as the message commanded and poured the foul gloop along the river bank. Right before his eyes, tiny shoots pushed through the earth and grew into a marvellous, colourful jungle of flowers stretching out towards the sky. 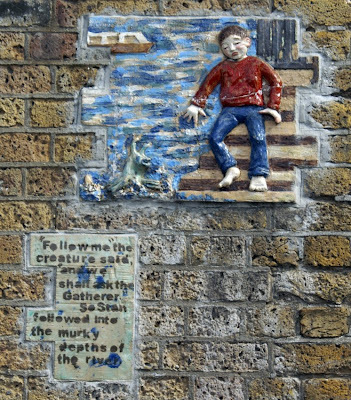 'Follow me' the creature said, 'and we shall ask the Gatherer.' So Stan followed into the murky depths of the river. 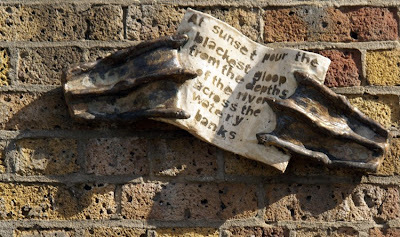 At sunset pour the blackest gloop from the depths of the river across the watery bank. It was a warm, sunny afternoon. 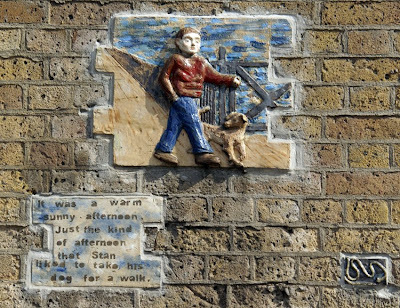 Just the kind of afernoon that Stan liked to take his dog for a walk. 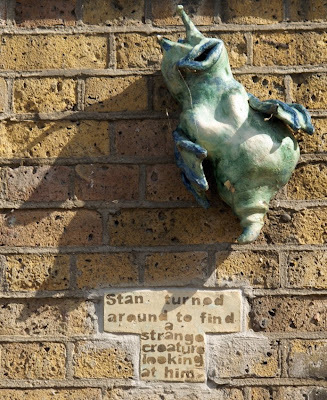 Stan turned around to find a strange creature looking at him. 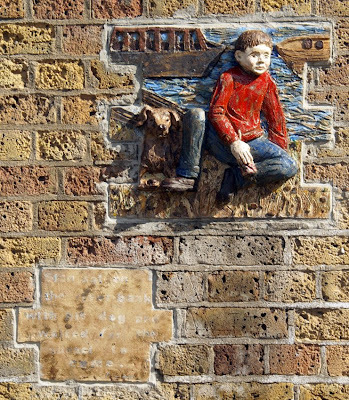 On a brick wall down by the river at Greenwich is a lovely artwork: the illustrated Thames Tale by Amanda Hinge. 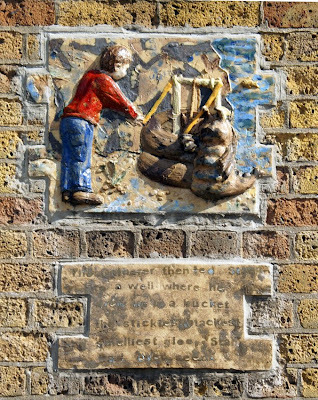 As the Greenwich Phantom has pointed out, it's a little mysterious - all the more so since the website address on the wall no longer works - but very charming. What are the five London bridges visible in this photo? And which bridge is missing? Click to enlarge the photo; and no cheating with a map! In a nice contrast to other recent coverage, the Guardian's Let's move to... Deptford article was mainly positive about the area. Even if they failed to notice any of the parks and used the dullest photograph possible. I had always thought of the Daily Express Building, a piece of black-and-silver Art Deco on Fleet Street, as a purely London landmark. 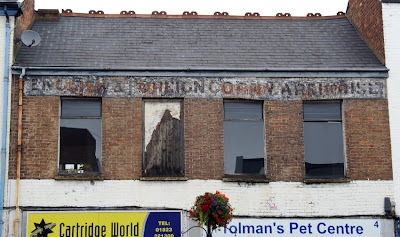 However, thanks to a post on the excellent new Lost in Manchester blog, I discovered that it is in fact one of three (with the final 'triplet' in Glasgow). London's version was built between 1930 and 1932 by architects Ellis & Clarke with Sir Owen Williams. He had trained as an engineer before moving to architecture and was responsible for buildings including Wembley Stadium and the Peckham Pioneer Health Centre. After the war, he would build the M1 motorway. The structure is concrete, with the basement originally holding the printing press and the journalists working on the upper floors. Lord Beaverbrook liked the fact that the glass curtain walls meant Londoners could see his journalists working into the night. 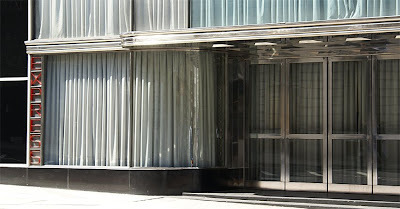 The exterior is a mixture of chromium, clear glass and black Vitrolite. Pilkington manufactured this pigmented glass in a range of colours; it was used for interior tiling as well as external facades. Peer through the gaps in the curtains and you might be able to see the reliefs and exuberant Deco flourishes in the lobby. When new, the Express building was supposed to be 'Britain's most modern building for Britain's most modern newspaper'. However, it was parodied by Evelyn Waugh in Scoop and later nicknamed the Black Lubyanka. 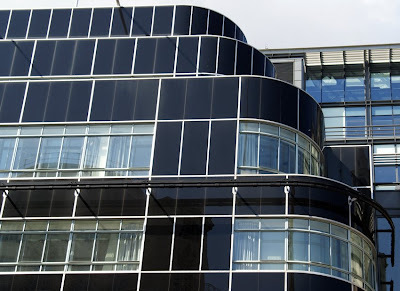 The Manchester and Glasgow buildings are by the same architect (Glasgow was built in 1937 and Manchester in 1939) and have similar chrome, glass and vitrolite facades. None of the three are homes to the Daily Express any longer. 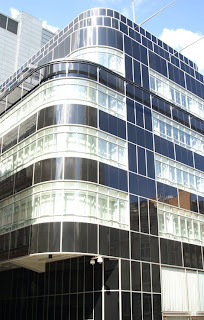 The newspaper left Fleet Street in 1989; the building was subsequently restored to its current splendour and is now occupied by Goldman Sachs.